I always love to see before and afters when it comes to what photographers and Photoshop can do to an image. Unfortunately many photographers aren't willing to share what they consider to be "unfinished" work or how they got to the end result. I will be the first to admit I don't get it right in the camera every time. Luckily my background in Photoshop dates back as early to my first website in the 6th grade. I judge a good photographer by the end result - I don't care how they got there. I shoot in RAW format. Well, RAW + JPEG to be exact. RAW files have a lot of flexibility. You can change exposure, color balance, highlights, shadows, saturation - THE WORKS - before burning the image as a JPEG. There's a reason the file format is huge. Having that ability to go back and correct a mistake I've made on the camera is priceless. Take this image as an example. It's completely blown out (or over exposed) but with Camera Raw in Photoshop I was able to bring out the blacks in the image and re-saturate the washed out colors. After the application of some of my favorite Photoshop Actions (the Florabella "Vintage Summer" action to be exact) and VOILA. 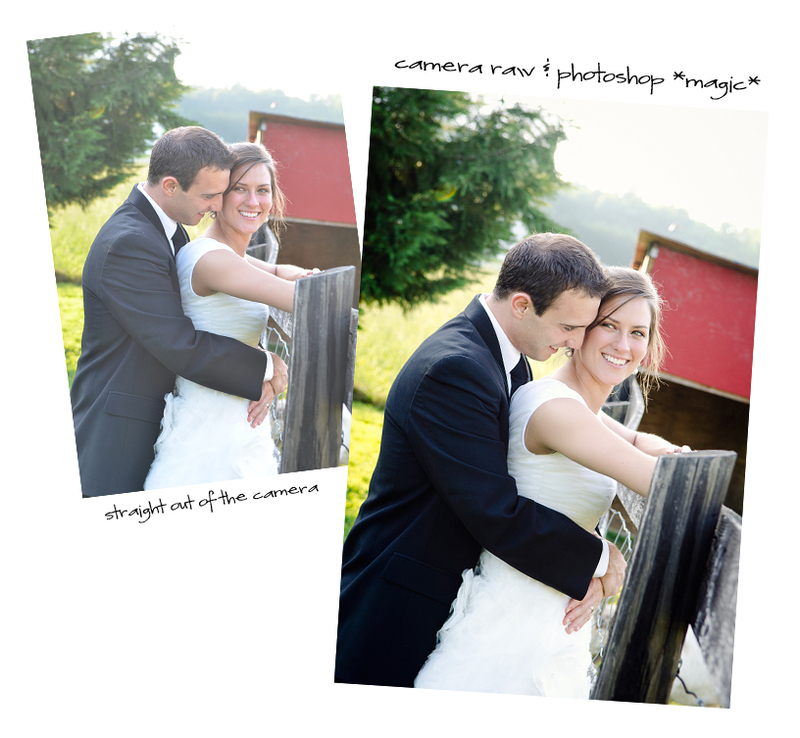 One of my favorite images from Jacob & Jessie's wedding! Hey Kelli, you do great work! If you get a chance, could you please expand on what you mean by "Camera Raw" in Photoshop? Is that an action or tool in photoshop? I am still unfamiliar with shooting in Raw. My photography class never really covered that.